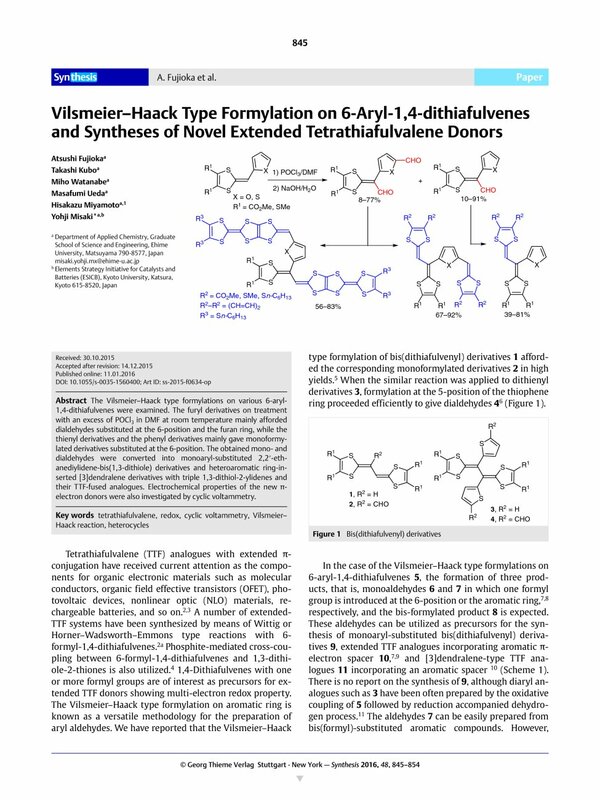 The Vilsmeier–Haack type formylations on various 6-aryl-1,4-dithiafulvenes were examined. The furyl derivatives on treatment with an excess of POCl3 in DMF at room temperature mainly afforded dialdehydes substituted at the 6-position and the furan ring, while the thienyl derivatives and the phenyl derivatives mainly gave monoformylated derivatives substituted at the 6-position. The obtained mono- and dialdehydes were converted into monoaryl-substituted 2,2′-ethanediylidene-bis(1,3-dithiole) derivatives and heteroaromatic ring-inserted dendralene derivatives with triple 1,3-dithiol-2-ylidenes and their TTF-fused analogues. Electrochemical properties of the new π-electron donors were also investigated by cyclic voltammetry. Supporting information for this article is available online at http://dx.doi.org/10.1055/s-0035-1560400. 1 Present address: Department of General Education of Science, National Institute of Technology, Kurume College, Komorino, Kurume 830-8555, Japan. 17 Large-scale synthesis by using 10 mmol of 5 has only little influence on the yield, and there was no particular problem in the experimental operation.